PetroVietnam Power Corp, or PV Power, has been granted government approval to build two gas-fired power plants in southern Vietnam at a total cost of nearly $1.5 billion, its parent company said on Thursday (26/04). Viet Nam will not build more new sugarcane plants between now and 2020, following a plan for the sugar industry’s development until 2020 with a vision to 2030. Vietnam is the latest in the growing list of countries to be hit by ICO scams. Following an alleged fraud of VND 15 trillion (US$ 658 million) related to cryptocurrency that scammed 32,000 investors, the Prime Minister signed a directive asking the Ministry of Finance and the State Bank of Vietnam (SBV) to strengthen the management of cryptocurrency activities. The price of raw cashews in Binh Phuoc Province has fallen from VND29,000 (US$1.27) per kilo to VND12,000-14,000 per kilo, mostly due to poor quality, according to Tran Thi Yen, director of Bu Gia Map agricultural cooperative. The container port operated by First Logistics Development JV, a major port located along the Saigon River, is not included on the list of ports to be removed by the Ministry of Transport released recently. National flag carrier Vietnam Airlines and ST Aerospace has signed a Memorandum of Understanding (MOU) to provide component Maintenance, Repair & Overhaul (MRO) solutions. The political contentions and factionalism at the top of the Communist Party of Vietnam (CPV) have and will continue to catch isolated investors in the crosshairs in the coming year. The capital city of Hanoi has been asked to pay attention to mobilising resources to build a rail line connecting the downtown area with Noi Bai Airport and accelerate the implementation of the project. Without a proper supply chain, Viet Nam’s agriculture may be in for a harsh winter. Experts discussed effective strategies and interventions to solve gender discriminations present in the provisions of the current 2012 Labour Code during a workshop held in Hà Nội on Thursday. Thirteen localities have been marked as “good” in the ranking of agro-forestry-fishery product safety management in 2017 announced by the Ministry of Agriculture and Rural Development (MARD). FPT Retail on Thursday listed 40 million shares on the Ho Chi Minh City bourse while budget carrier Vietjet has again expressed interest in listing its shares on an overseas stock exchange. The Vietnam Airlines Corporation earned nearly 1.46 trillion VND (64.3 million USD) in pre-tax profit in the first three months of the year, 6.2 percent higher its set plan. A Memorandum of Understanding (MoU) to establish a joint venture between Vietnam Airlines and Singapore Technologies Aerospace Ltd (ST Aerospace) was signed on April 26. Deputy Minister of Health Nguyen Thanh Long has said that his ministry is planning to abolish 1,151 of the total 1,680 business conditions, equivalent to 68.51%, and reduce 168 of the 338 administrative procedures, accounting for 49.7%. Despite strong growth, investment into innovative start-ups in Viet Nam remains relatively modest compared to the region and the world. 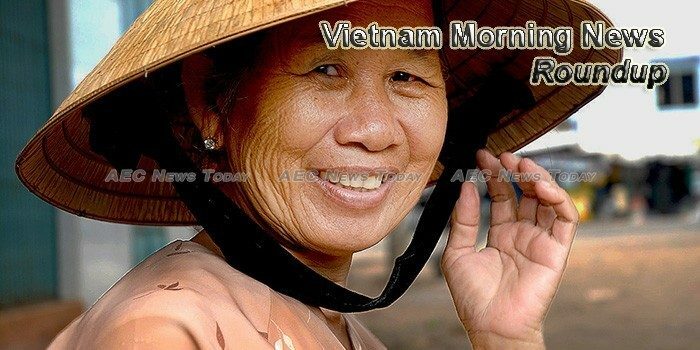 Vietnam is one of the countries within the Association of Southeast Asian Nations (ASEAN) with one of the fastest-growing economies in the world. In March 2018, the Vietnamese President Tran Dai Quang met South Korean President Moon Jae-in in Hanoi, the capital of Vietnam. Vietnamese Vice President Dang Thi Ngoc Thinh has urged women to take the lead in fostering economic connectivity and international cooperation and equip themselves with new skills and knowledge so that they are not left behind in the digital era and the fourth industrial revolution. Rice export prices rose for a fifth straight week in Vietnam as demand remained robust and supplies thinned, but rates of Indian and Thai varieties dipped amid weakness in the local currencies of the top exporters. Three big Thailand-based agriculture groups on Wednesday signed a memorandum of understanding (MoU) with Vietnamese LINA Network to apply blockchain to make the source and quality of products transparent.